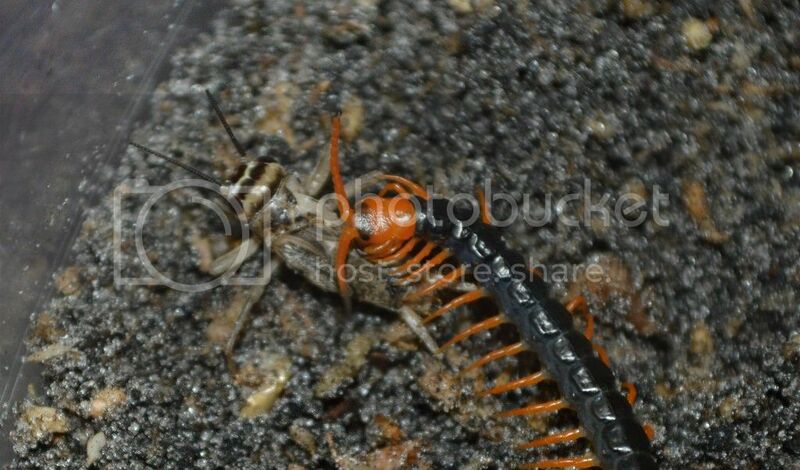 One seems to be acting kinda weird, but the other has already taken a cricket. Hopefully the other one is just shy.. I read their venom is pretty serious, but not likely deadly. I have experience with scorpions, tarantulas, and true spiders -- so I think I'm good to go. I actually had a small colony of black widows as pets when I was young - probably wasn't the best decision of my life. Apparently these grow up to 20 cm. Their mother at the pet store is about this size. Pretty big! 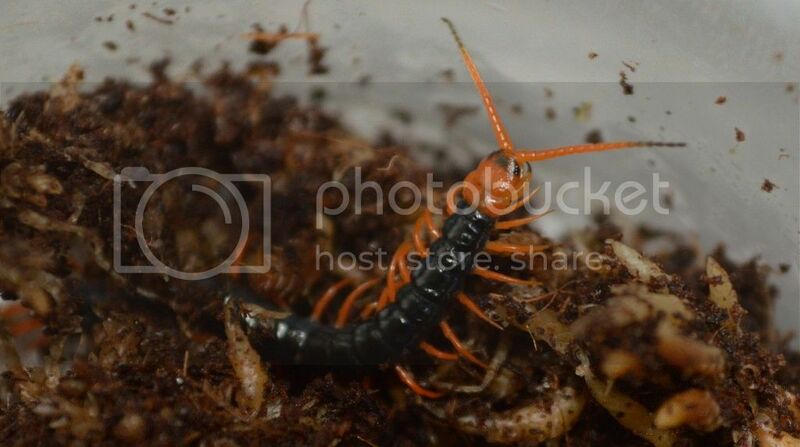 Anyone else keep any creepy crawlies? Motherly love! Phone pic from a while ago. Awesome looking fellows, have a great contrast between the colours, how is there dietary needs? Their diet is basically whatever they can kill and eat. 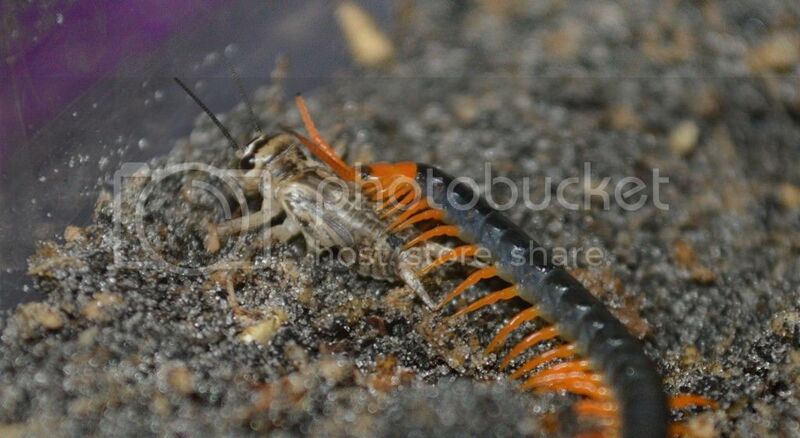 In captivity, most people feed them roaches, crickets, and mice (once big enough). Sadly, one of them died about an hour after bringing it home. I can only guess it was damaged somehow when the guy picked it up with forceps. But the other one is doing great! Already taken two meals. Here he is eating a medium cricket. Despite how big he looks in my photos, he is only about 1.5" long. That's a shame, at least one of them is going strong, it looks like it would take them a year to eat a cricket. Wow they are so cool! Send more pictures showing their growth, wish I could have but I can't keep anything even remotely venomous because of severe allergies. Keep us posted on progress!! So beautiful. 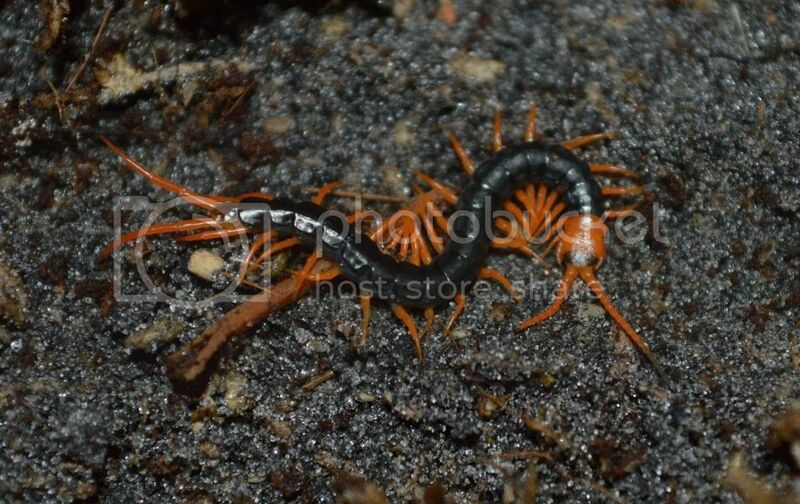 Thinking of getting a millipede. I had millipedes once, too. In first grade we were doing a school project with them, and when we were finished — I took them all home. Fed them potatoes mostly. The pet store couldn't swap out the one that died because I got the last two, but the one remaining is doing great. Already has his own little lair made. Ate a total of three crickets so far. Splashy07, you should post some pics of your Lubber grasshoppers. I see them everywhere on my college campus, and I'm thinking about starting a colony. They're beautiful! I had lubbers for over a year, gorgeous things, bought as nymphs at a reptile expo. They're great pets, and so easy to care for. Kids love them and can handle without them jumping and flying away, and they eat from your hand. Note the difference between the nymphs (black) and adults! They look like a different species! They were breeding like crazy, but no fertile eggs. I may try again next time I see them. Sorry for bad cell phone pics, they're all I have. Wow, I thought those were different species! People usually just kill them here — I may spare the lives of a few this summer. Uh oh, looks like I'm turning into a entomoculturist. Aww, how could anyone hurt those gorgeous creatures...I've always loved insects, then it evolved to reptiles but I never lost interest in bugs. Can't wait for my hyalophora cecropia to enclose, raised them from eggs last summer. Gosh, I kept a few caterpillars when I was young, too. I remember back in Tennessee, I would occasionally find the Hickory Horned Devil — those were SOO scary when I was young. But I wouldn't mind a few of them now. Eclose, not enclose! Darn spell check sometimes doesn't recognize bug terms!! I raised Prometheas too, here they are. I have been trying to get regalis for years. You actually found some in the wild? How awesome! Yah, about three in my lifetime. Occasionally find the moths, too. Big! I really like the Luna moth, too. They're beautiful. You have a beautiful assortment of bugs! I've only seen one Luna in the wild, in South Carolina...was on my way to Florida and stopped at Wendy's to get a sandwich and one flitted across the parking lot. I almost dropped dead. I tried to raise them, but the caterpillars did not make it, needless to say I was devastated and did not try again. I find the easiest of the giant silk moths to be the Polyphemus. Here's another fancy of mine, raised from a tiny hatchling from 'bugs in cyberspace', lived for over a year. African giant mantis. Was getting ghost mantises from a friend this month but he said he lost the entire brood, maybe another hatch in about a month. Probably won't be doing much bug stuff this year as I am anticipating baby skinks...hopefully!! I also breed our local mantises every year, they are my favorites but just don't live as long as some of the varieties offered as pets. Happy bugging! Save some of those sweet lubbers from certain execution! And I will be searching forever for one of those Florida giant katydids!! Another picture of the little dude in all his evil-ness. Still doing good. Feeding the carnivorous ones was always the bigger issue - Living out in the middle of no where I was kinda stuck collecting all the food, and could never collect enough to start any sort of sustainable breeding colony.